The most protected (anti-theft) method of securing the flag is by attaching the flag directly to the flagpole, to change the flag, simply use the tilt base and lower the flagpole. Ropes can be used to raise a second flag at special times i.e. Christmas. Spun aluminum alloy 6061, standard wall thickness .060 inch, wall thickness and diameter in accordance with pole size(3″ to 12″), finished to match pole. 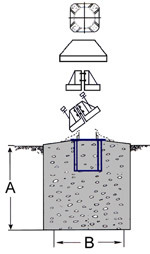 Embedded in-ground flagpoles are 20% stronger than shoe mount bases. Foundation sleeve is a galvanized 16 gauge tube with base plate & lighting spike. Anchor Bolt Assembly is galvanized steel and applied with bituminous paint, with a minimum pull out strength of 20,000 lbs. Thread size 5/8″, ¾” and 1″ dia. sized in accordance with flagpole size. 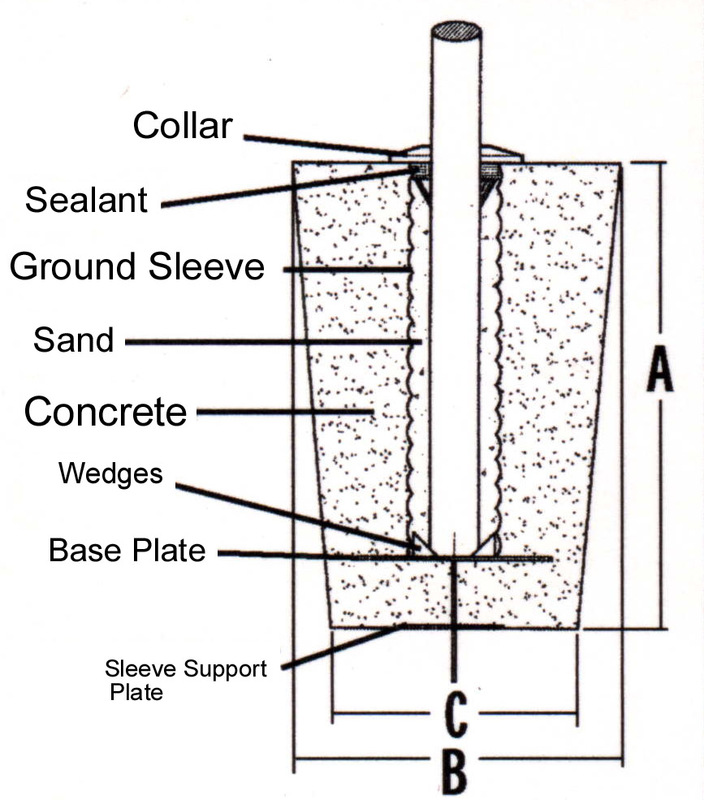 Insert into concrete and level. Stationary Shoe Base requires a lift truck to place flagpole on anchor bolt assembly. If the anchor bolt is not level, extra levelling can occur at the shoe. Tilt Shoe Base has two purposes (1) effortless installation, only one person is required to raise the flagpole. (2) maintenance and decorating the pole for events is made easy. Tilt pins are stainless steel and sized in accordance with flagpole size. If the anchor bolt is not level, extra levelling can occur at the shoe. Aluminum Shoe: cast aluminum alloy A356, heat treated to T-6. The shoe is inserted onto the shaft and joined by a continuous circumferential weld.